Bandit Lites is on the road bringing the elaborate performances of the circus to stages across the country with Cirque Musica. The stage and arena production blends all the wonders under the big top, including acrobats, violinists in flight, and tight-rope walkers with symphonic renditions of classical and pop music. Lighting designer Seth Jackson worked to give the lighting design the look of being under the big top by draping festoons in between trussing. Additionally, truss warmers are placed on upstage pieces to add more light and color. Finally, MAC 300s are on four upstage trusses utilizing Bandits new Pre Rigged A Type Truss with Bandits’ GRNLite Pars utilized as front lighting. The new Pre Rigged A Type Truss allows the MAC 300’s and other smaller fixtures to travel inside the small profile A type truss, saving truck space and set up time. Seth Jackson worked with Michael Golden and Dizzy Gosnell from Bandit to design this new truss, and it has been a success. 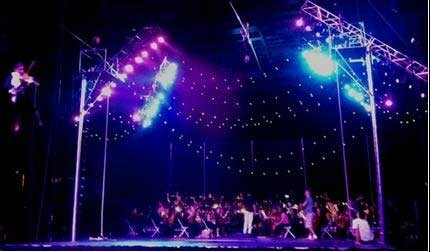 Initially, Jackson designed and programmed the show to the symphonic music; however, once the circus performers joined the show, the programming changed to fill the needs of the dynamic performances. "I changed a lot of the programming for some of the acts because they were so different than what was happening musically," explained the lighting director, Teresa Porterfield who uses a GrandMA console. "There were many times when the performers had to not be distracted by lighting. The balancing acts in particular were a focus concern. They couldn't have any movement at particular times, nor could any light be in their eyes. It was an interesting challenge every day." The tour began in June and continues into October in both theatres and arenas. Reviews of the show have been stunning, a sentiment that Porterfield echoes in her remarks about being a member of the team. "Cirque Musica was a blast!" she said. "I've never worked with circus folk before, but they are such hard working, talented performers. Every day presented a new challenge, whether it be rigging or height and space issues; but everyone pulled together to make a great show. I'm proud to be a part of it, and Seth was a pleasure to work with. He really matched what was happening musically to the lighting and gave a great basis for what was to come. He showed me that, in the face of the unknown, do as much as you can, as best you can. That way you're covered and you still have a few tricks up your sleeve."